Ms. Martha (standing in back) is a former public school music director. She holds a master’s degree and has taught all levels (elementary through adult education) for 20+ years in the El Paso and San Antonio areas. Martha truly loves working with children because teaching is her passion. 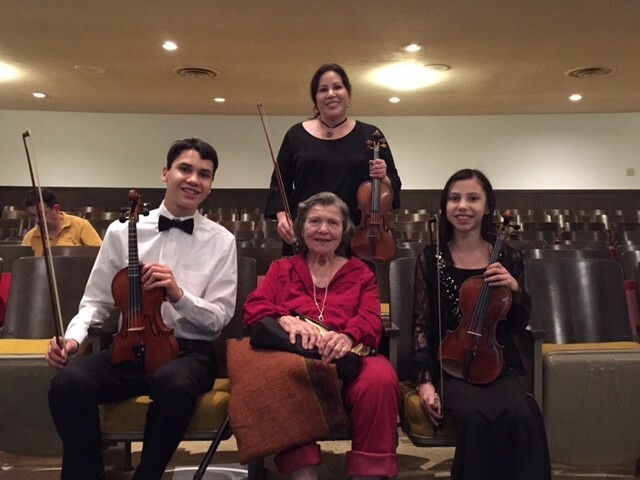 Martha enjoys giving to the community by holding music recitals for senior citizens. She has obtained Kodaly, ORFF, and Suzuki training and enjoys integrating these methods during her lessons. Martha is always continuing her education because she believes teachers should be lifelong learners. While residing in El Paso, Ms. Marquez studied and performed under Maestro Abraham Chavez (former conductor for the El Paso Symphony). In addition, Martha intensely studied classical guitar from a local classical guitar legend, Charles Teitsworth. Martha moved to San Antonio over thirteen years ago where she began teaching music for the United States Air Force. During this season she also began teaching for Antonio Strad Violin. She has used her spare time to play for the Community Bible Church Orchestra, the University of Incarnate Word Community Orchestra, and Salterelli Orchestra. She currently plays for the South Texas Symphonic Orchestra under conductor Ronnie Sanders. Her most favorite thing to do is listen to birds sing. It is music to her ears! Mr. Isaiah (Sitting down to the right of Mrs. Salterelli) has been playing violin since he was in early elementary school. He began performing for adult orchestras at the age of fourteen. He has played for Texas Lutheran University, Community Bible Church and Salterelli (Adult orchestra). He now plays for the South Texas Symphony in San Antonio. Isaiah enjoys teaching strings for private schools. He also has volunteer hours teaching music for the United States Air Force. Isaiah recently completed a year internship with NASA. He is working on his mechanical engineering degree with a minor in music. His students love his calm and tender demeanor. Mr. Abraham is the Webmaster & Manager of Operations for NSA Music Studio. He also is one of our instructors. Mr. Abraham teaches and plays classical, acoustic and electric guitar using all genres (classical, jazz, and rock). He was trained under Nestor Arzola and began playing guitar in high school. When Mr. Abraham is not playing his guitar or cello, he is spending time with his children and wife of twenty-one years.